In remote corners of Bolivia, local communities are pioneering sustainable mining and forestry strategies that could provide useful models in the global struggle against climate change. Deep in the Yungas cloud forest outside La Paz, Bolivia, in Cotapata National Park, the Cotapata Mining Cooperative (see video below) is producing the world’s first “fair-trade/ fair-mined” gold, certified last December by the non-profit Fairtrade International (FLO) and the Alliance for Responsible Mining (ARM). The cooperative was officially formed in 1991 when it secured land rights and a mining concession from the government, after many years of informal mining activity. The cooperative currently consists of 88 families, including 3 women who work as mining technicians. Cotapata Mining Cooperative. Credit: ARMThe workers live in a tent camp during their 2-week shifts, leaving their families behind in La Paz. The cooperative produces 6-7 pounds of gold per month. Cotapata is one of 500 community-based “artisanal” mining organizations that account for more than 80% of Bolivia’s mining workforce. This sector has been dominant since the collapse of the state mining industry in 1985, and is characterized by modest wages, dangerous working conditions, and environmental contamination from toxic chemicals used in the extraction process. Cooperative mining is expanding rapidly as soaring mineral prices draw subsistence farmers to more viable opportunities. At Cotapata, the cooperative subscribes to FLO standards mandating improved working conditions, collective bargaining rights, restrictions on child labor, responsible use of toxic chemicals, and support for the local community. In exchange, they are guaranteed to receive at least 95% of the international gold price (currently most small mining producers get only 30% - 85%, due to exploitation by middlemen). With its fair trade designation, the cooperative can now sell directly to European importers linked to the FLO network, avoiding costly intermediaries. In addition, they receive a 10% fair-trade premium to reinvest in community and business projects. “The first thing we will do is buy a smelter,” says coop leader Juana Peña Endata. The cooperative is recognized for its high level of organization and respectful labor and environmental practices. All workers receive the same monthly salary of $300-$600 (depending on the profitability of the mine), as well as insurance benefits. This is much higher than the current minimum wage of $97. Cotapata has pioneered the use of a closed-circuit mercury recovery system to reduce environmental degradation. If they can eliminate the use of toxic chemicals altogether, they will receive an additional 5% premium. Current premiums are also being used to improve housing conditions and health services at the camp, and to support local schools. At least eight other mining cooperatives in Peru, Colombia, and Ecuador are in the process of being certified by FLO and ARM. Meanwhile, twenty jewelry companies have signed up to sell fair trade/ fair mined gold products. The goal is to capture at least 5% of the gold jewelry market in the next 15 years. In the tropical dry forests of Santa Cruz, the indigenous community of Zapocó is the first in Bolivia to sell its timber through a public bidding process to a manufacturer committed to sustainable forest management. Zapocó Community Forestry. 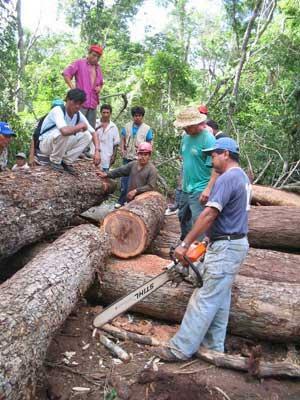 Credit: APCOBAs Jean Friedman-Rudovsky describes in a recent Time article, the community of 65 families secured a 20-year logging concession from the government in 2001, with the help of APCOB, a local NGO. With the 6th largest forest area in the world, Bolivia currently loses an estimated 1.2 million acres per year to logging, agribusiness, and cattle ranching, primarily on indigenous land. For groups like Zapocó, community forest management is a strategy for both sustainable development and the defense of ancestral territory and resources. Under a new initiative established with the World Wildlife Fund (WWF), Zapocó manages its forests, harvests its trees, and markets its lumber according to strict sustainability standards set by the non-profit Forest Stewardship Council. Logging is based on a long-term plan that targets only select, mature trees and maintains forest habitat for diverse species. Zapocó receives a fair market price for its certified wood through its 4-year contract with Petunos, the Bolivian company that won the public bid, which makes deck flooring for the US market. A portion of the sales proceeds is allocated to community benefits, including education, health services, agriculture, and reinvestment in the forestry program. According to Friedman-Rudovsky, the new initiative has brought financial stability to Zapocó for the first time. Most community members are employed by the forestry project, and residents also receive an annual stipend of $150 to cover basic family needs. Petunos belongs to Bolivia’s Global Forest and Trade Network, one of 30 WWF-sponsored alliances that link certified wood producers with responsible manufacturers and purchasers of forest products. More than 350 companies, NGOs, and governments are involved in the worldwide network, along with dozens of other indigenous forest managers like Zapocó. To be sure, these initiatives are barely making a dent in the mining and forestry industries, and the income received by communities like Cotapata and Zapocó is only a pittance compared to the enormous profits generated further up the supply chain. Still, projects that empower local communities while furthering the goals of sustainability and economic development help to model an alternative future that looks a lot better than the present.